The late nineteenth century was truly a golden age in children’s literature. As the concept of childhood evolved, didacticism fell out of style and children’s authors focused more on stimulating their readers’ imaginations with exciting, engaging tales. George Alfred Henty was one of the most popular figures of the era. His historical adventure stories appealed to both children and young adults, but Henty was a controversial figure even in his own time. Henty was born on December 8, 1832 in Trumpington, outside Cambridge. A sickly child, he entertained himself by diving into books and remained an avid reader all his life. Henty attended Westminster School, and then Gonville and Caius College, Cambridge, where he distinguished himself as a sportsman. But Henty left school before earning a degree; he and his brother decided to volunteer for the Army when the Crimean War began. Henty was assigned to the Army Hospital Commissariat. Conditions at the front were horrible, and Henty sent his father detailed letters about the appalling state of affairs. His father submitted the letters to the Morning Advertiser, which published them enthusiastically. Seeing little promise of promotion, Henty resigned from the Army in 1859. He married Elizabeth Finucane shortly thereafter, but the union would be a short one; Elizabeth died in 1865 after a long illness. Left with children and unsure of his career path, Henty decided to begin writing for the Standard newspaper. By 1866, he was working as a special correspondent. During his career, Henty would cover the Franco-Prussian War; the Carlist Rebellion in Spain; the Turco-Serbian War; the opening of the Suez Canal; and the Dreyfus Trial. To research his books, Henty would check out numerous books from his local library. His protagonists were usually intelligent, plucky, and modest young men–and occasionally women who were living through historically difficult times. The books were full of action and drama, appealing to young readers. But they also raised ire among many of Henty’s Victorian contemporaries–after all, Henty was hardly an unbiased author. During his own lifetime Henty was frequently accused of being xenophobic and racist. An enthusiastic imperialist, Henty also drew criticism for glorifying British imperialism. His In the Reign of Terror (1888) and No Surrender! A Tale of the Rising in La Vendee (1900) were decidedly hostile toward the patriots of the French Revolution, and in True to the Old Flag (1885), Henty took a Loyalist stance regarding the American Revolutionary War. With Lee in Virginia (1890) also raised eyebrows for supporting the “aristocratic” Confederacy of the Civil War. In the 1990′s, Henty’s books were taken up by conservative Christians and home-schoolers because of their wholesome protagonists. But these stories are also frequently criticized for being jingoist and promoting racism. A Roving Commission,or Through the Black Insurrection at Hayti (1900) is overtly racist, making it an inappropriate text from which to teach that period of history. 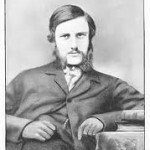 Henty has remained a popular figure among book collectors because his stories are so captivating and his works were so prodigious; in total, Henty penned 144 books, myriad short stories, and numerous pieces for several periodicals. Collectors usually rely on the second edition of Peter Newbolt’s GA Henty, 1832-1902 for bibliographic guidance. George Manville Fenn published a biography of Henty in 1907, but the work is generally considered too dispassionate. Thus the Henty Society is publishing a new biography, due out this year. 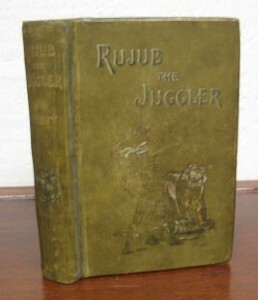 Henty’s books often have intricately designed bindings, often appealing to collectors in their own right. It’s quite rare to find these books in their original dust jackets, so most collectors settle for jacket-less copies in the best condition possible. Though George Alfred Henty never became a household name in children’s literature, he nevertheless left an indelible mark on the genre. Henty’s books will continue to delight readers and collectors alike for ages to come. 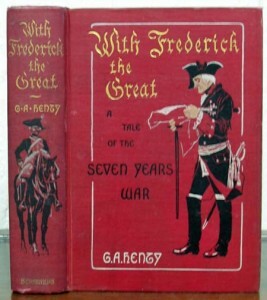 This entry was posted in 19th-Century Literature, Children's Books, Collecting and tagged children's books, George Alfred Henty, historical fiction, Victorian England on May 6, 2014 by tavistock_books.